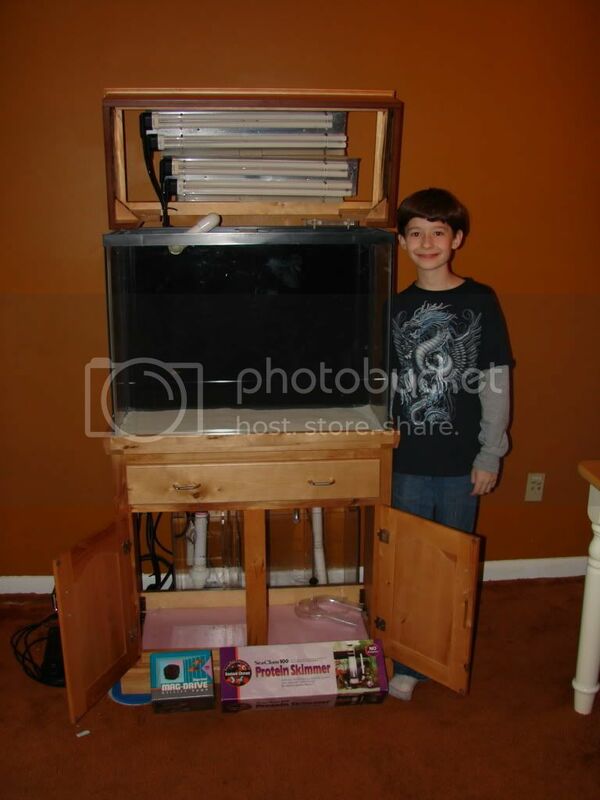 After much planning and saving, my soon to be 12 year old is ready to start his "Fragging Display Tank"
its a retrofit PC lighting has 4 65w bulbs and reflectors and ballast comes with 2 switches and power cords so you can have daylight and actinic on separate timers. 2x65 on each cord. and the lighting is mounted inside the hood. Here he is with the new set up. We are moving the sump behind the tank and stand and are going to add a custom (that means we are going to make it ) enclosure with an egg crate style top to allow for ventilation. This decision was made, due in no small part, because of the change in plans for the skimmer. I must say blown76mav and jungliztkruger did an awesome job building a sump that fits TIGHT but not too tight. However, I foresaw future maintainability issues, so I decided to do the behind the stand thing. as this is still under construction, pics of that part of the build will be posted later. 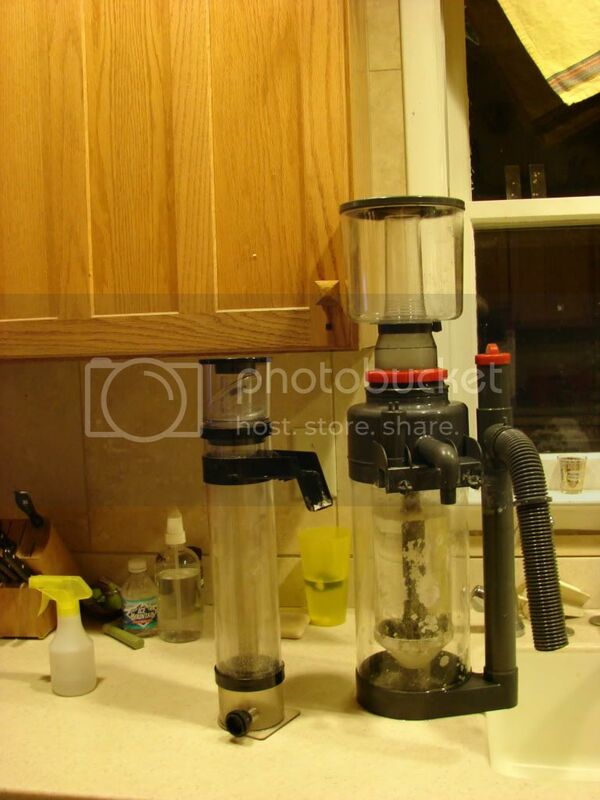 So now, as you might have noticed from my other post, we are looking for a pump for the skimmer. My options are a MAG 5 equipped with a needle wheel impeller or an OME spec pump that is also equipped with a needle wheel impeller. Have to make a decision on this this week. Well...I think this is all for the 1st post from me. Nick however is writing a little post that he wants me to add, so that will be posted soon. I am very much looking forward to watching this build as it progresses! very nice glad to see you and your soon enjoying this together , and nice skimmer upgrade. It's nice to see that kids still need us every now and then. Looking forward to the final product. Having used both the SeaClone and the Super Skimmer I'll tell you that while the SeaClone would probably be more then adequate for that size tank, but the maintenance required to keep the stupid thing happy would drive you bonkers. Those things are TOUCHY! The super skimmer is a good snag. I have an Eheim pump attached to mine and it's working wonders. Looking forward to following this! What a fun Dad and son time! This is much more constructive than the potato cannons I made as a kid. And a great way for you two to spend some time together. This and the astronomy tomorrow the tube for the Dobsonian Telescope Build ! Question: with 4 65 watt PC, 2 are actinic and 2 are 10,000k. Should I change out 1 of the actinic lights for another 10,000k ? How useful, pros cons, would it be ? Also ... Water going in the tank tonight ! I think you should keep it balanced. 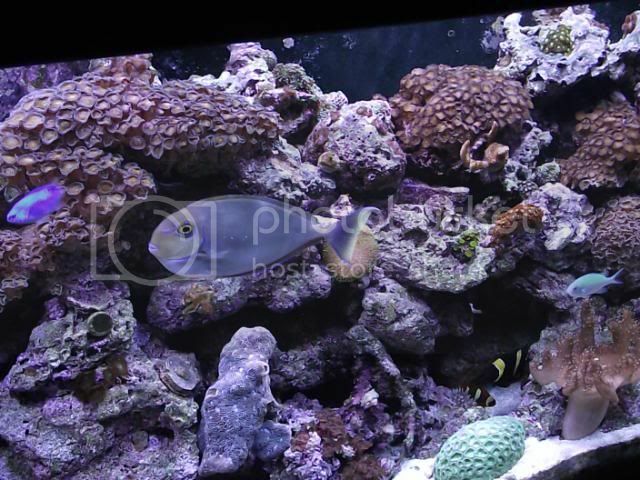 The actinic lighting makes the colors of the coral, and fish stand out more.